hahah I am sure my hubby would love these. So flakes not same as grated? Flaked coconuts have a much coarser texture and more moist than the desiccated ones but less moist that the freshly grated ones. It is somewhere in between, have a longer shelf life that the grated ones, store it in the fridge. I love using this in baked goods, more chewier with full coconut flavour. Try it! Thanks for stopping by! Looks delish. I have been searching for a coconut cakeysomethingorother... this might just be it! I am sure I can eat several of those delicious looking cakes of yours too! Great for lunch in office! must be so light and moist! do you think i can just take one and pop into my mouth? hehe..nice tea cakes! They look so cute, love the coconut flavor, added to my try out list.. These must melt on your mouth and give you a taste sensation; looks wonderful. I love coconut! These cakes look amazing! These coconut cupcakes look lovely for my breakfast!! Now, these muffins look scrumptiously delicious! Yes, egg whites can be frozen up to a year in the freezer. I usually keep them in fours or twos in containers, label and store them in the freezer. These will be perfect for a meeting I'm hosting. Plus, there's egg whites in the fridge which need to be used. I don't blame you for sampling while taking pictures, they look irresistible. Very delicious ones,fabulous coconut flavor in it!! 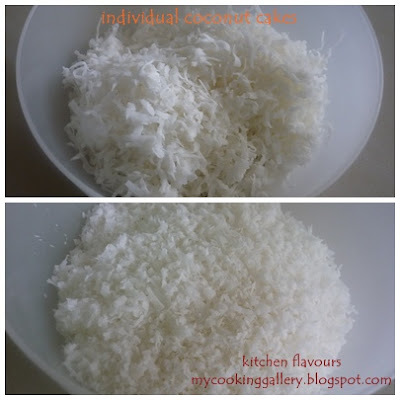 Joy, these are perfect for coconut lovers! thanks. These bite sized coconut cakes look awesome! Their moist and buttery texture look so inviting. I hope you enjoy this as much as we did! Have a lovely weekend! What gorgeous little cakes, Joyce - I love the moistness that comes from making anything with coconut in it. Must give these a try. These look so good Joy, I can understand how you could easily pop three into your mouth while taking pics, lol! I love anything with coconut and wouldn't want to share these! I love coconut! They look so delicious and I love how they are one-bite mini cakes. Lovely! Hi Kitchen flavours, how you doin'? I sure love your this creations, looks really good. I have always loved anything with coconuts, or pineapples. You mind I copy the 2nd pic? Will display it in my pondok when I naik angin, credit you. Thanks for stopping by! sure, you may use the pic. Will stop by soon! I adore coconut flakes and these mini cakes are really tempting with soft and moist texture. Me encantan son especiales para mis vistas de hoy una delicia los voy a preparar,abrazos hugs,hugs. We just love Coconut Cake, as a matter of fact I have it on the Menu for next week. I may make your recipe instead, it looks awesome! Thank you so much for sharing with Full Plate Thursday. Hope you have a great week end and come back soon!